It’s been awhile since we’ve done an episode of “Flight School,” and there was no better place to start that up again than at Texas Ale Project in Dallas, TX. As you might know, Texas is HOT, and the beers that Texas Ale Project is brewing are the perfect answer to the Texas heat. With plenty of German-influenced beers or just a good brew with a clean finish, this flavorful flight made for a great reintroduction to Texas beer. 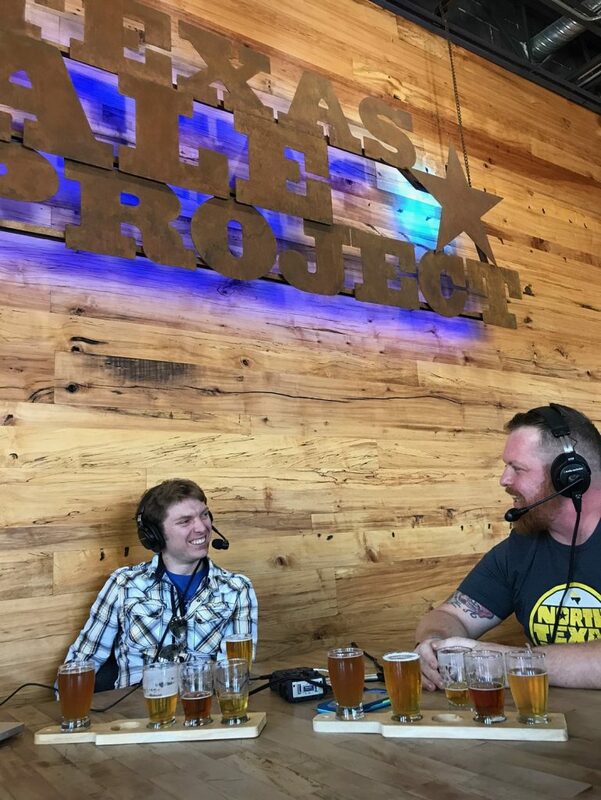 In this episode, we had the pleasure of sitting down with Derrick “Moose” Rima, the Lead Brewer at Texas Ale Project, and quite frankly just a great guy to have a drink with. Moose first discovered his love for beer while serving in the military over in Germany. His stories give us an understanding of the Dallas craft beer community, and some of his own unconventional methods of staying hydrated while drinking. 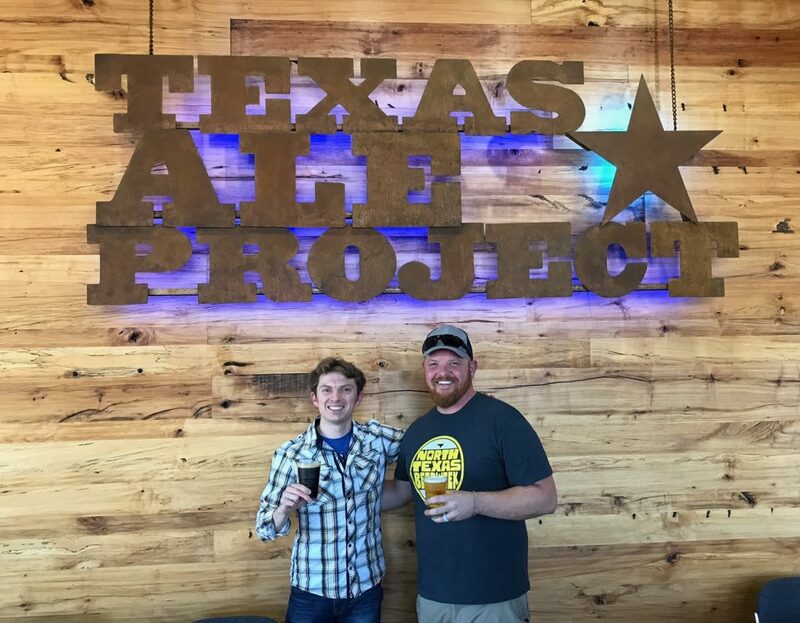 Located just about a mile from downtown Dallas, TX in the Arts District (or as the brewers like to call it, the “Brewing District”), Texas Ale Project is the first pre-prohibition brewery in the United States to be built from the ground up. The sleek new brewery has a great view of downtown Dallas, with a modern taproom serving up clean-finishing beers that pay homage to Texas culture. 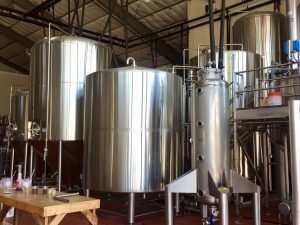 The sleek, modern brewhouse at T.A.P. At Texas Ale Project (T.A.P. ), they use a step mashing process to create the small chain sugars that allows beers to finish drier and cleaner. Most of the beers’ names here are a nod to the state of Texas, including the Fire Ant Funeral, 50 Foot Jackrabbit, and the 100 Million Angels Singing (dedicated to The Man in Black himself, Johnny Cash). The brewery is located in the Dallas Arts District, an area that used to be home to the “ladies of the night” but is now full of art galleries, antique stores, boutiques, and of course, breweries and restaurants. Derrick got his nickname “Moose” while playing rugby during his time serving in Germany, a name inspired by Dallas Cowboys running back Daryl Johnston. Shoutout to LUCK and their brisket pastrami sandwich, which sounds like the perfect pairing for T.A.P.’s Fire Ant Funeral Amber. Moose loves LUCK’s braised beef tongue sandwich, which I’ll def need to try next time. Kat & Brent Thompson founded Texas Ale Project at the end of 2014, and it’s the first brewery pre-prohibition to be physically be built from the ground up. Fayetteville, AR has an Ale Trail! Being stationed in Germany was what converted Moose from a rum drinker to a beer drinker. Home brewing eventually turned into a career for Moose, and it’s pushed his creativity. He started a 1-barrel pilot program at T.A.P. that keeps patrons coming in on a weekly basis to try Texas Ale Project’s latest beer. Moose teaches all of us the value of getting your exercise in the middle of any bar crawl, as he used to sprint from bar-to-bar in Germany and chug some water in the process. Fire Ant Funeral – An ale with 7 different specialty malts while maintaining a dry character. Although it’s not a lager, the maltiness makes it similar to an Oktoberfest with hints of caramel and chocolate. Crystal 40L, Crystal 80L, Munich, and Vienna are just a few of the malts in the lineup that give it its flavor. Oh, and if you’re not familiar with Texas, fire ants are rampant there. The perfect name for a beer in my opinion, and it also pairs great with BBQ. 100 Million Angels Singing – Inspired by Johnny Cash, this is a surprising crushable double IPA…so drink with caution! The Caucasian – A nod to the film “The Big Lebowski,” this White Russian Imperial Stout is a beer take on the classic cocktail. There recent small 6-barrel batch contained $1,200 worth of Madagascar Bourbon vanilla beans, and 45 gallons of cold-brew coffee from Full City Rooster. Much as I would consider “The Big Lebowski” one of the greatest movies ever, I would say that Texas Ale Project’s “Caucasian” is one of the greatest beers ever. Four Corners Brewing – This brewery is right down the way in the Arts District, and was one of the spots where Derrick got his start and discovered his love for brewing. This neighborhood place was founded by 3 friends with a bit of beer knowledge, but more importantly an understanding of the value of neighborhood fellowship. Despite that last statement, please know that their beers are also awesome. BrainDead Brewing – Dave here runs a great kitchen, while Andrew is quite the brewer. They’ve also got a prime location in the Deep Ellum neighborhood, a hip spot for Dallas nightlife. Noble Rey Brewing – As Moose says, a fun group of guys run this place, and the brewery has a cool little bar area / brewpub. Peticolas Brewing – A fan-favorite in Dallas, they’ve won awards at the Great American Beer Festival, and have a unique, futbol club-style logo. Community Brewing – Another brewery not too far from Texas Ale Project, their Mosaic IPA has earned its spot as an award-winner too. Deep Ellum Brewing – If you’ve heard for Dallas craft beer, you’ve heard of Deep Ellum Brewing. It’s a Texas staple. 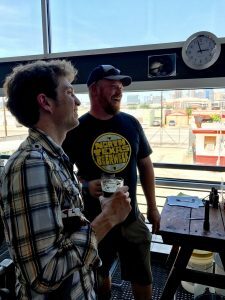 Dallas Brew Bus – A great resource from the Dallas Brew Scene that runs curated shuttle tours to the breweries around the Dallas-Ft. Worth area. As always, the brewery is probably the best place to find Derrick, but in order to keep up with Texas Ale Project, give them a follow on Facebook, Instagram, and Twitter. 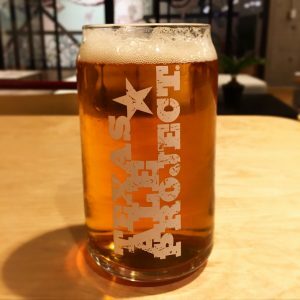 Visit the Texas Ale Project…now! Before they run out of The Caucasian! 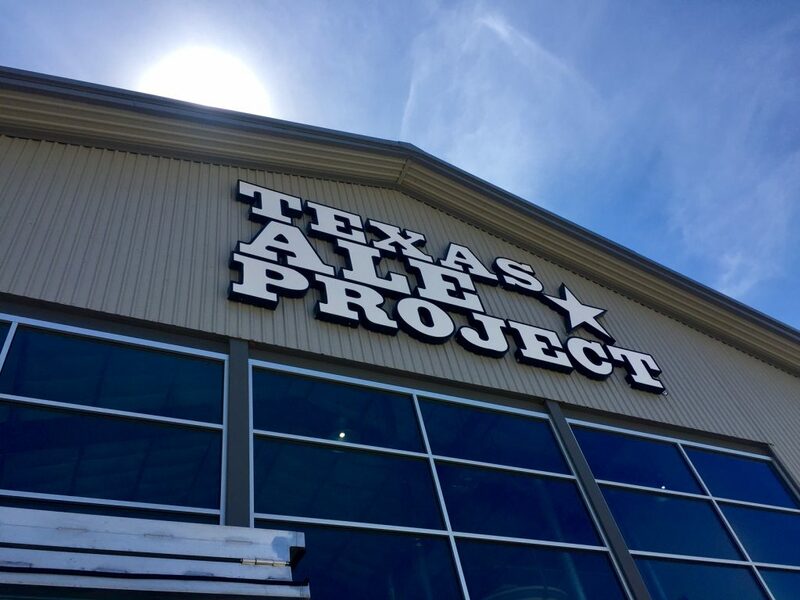 Texas Ale Project is located at 1001 N Riverfront Blvd, Dallas, TX 75207. Taproom hours are Thursday & Friday 5pm to 9pm, and Saturday from 1pm to 9pm. “Rock, Shock, and Load” by Thee Armada. Give them a listen on Spotify.